In 1969, he served in the U.S. Army with the First Platoon Company A 3rd Battalion/1st Infantry Regiment 11th Brigade Americal (23rd Infantry) Division. They were average American sons, fathers, husbands, and brothers who enlisted or were drafted from all over the United States and came from various backgrounds. They came together and formed a brotherhood that will last forever. ​Haynie shares his experiences about weeks of boredom and minutes to hours of terror, surviving the heat, carrying a 60-pound rucksack, monsoons, a forest fire, a typhoon, building a firebase, fear, death, and fighting the enemy—all while experiencing mental, physical and moral exhaustion. 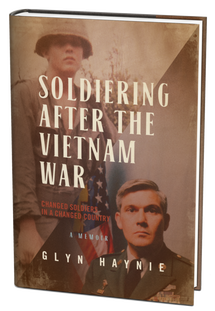 Haynie shares his struggles and his successes, completing a stellar 20-year career in the Army culminating as an instructor at the U.S. Army Sergeants Major Academy. His story is one that clearly demonstrates just how wrong those protestors were … and just how much our country does owe these men and women who served their country with bravery and honor … our gratitude and respect. His story will touch you in many ways … stirring feelings of embarrassment, anger, understanding, gratitude, and pride. It is a story all Americans should read. 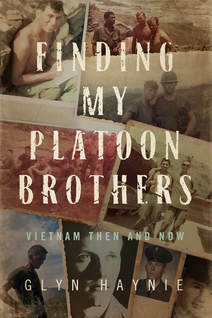 In Glyn Haynie’s newest book, Finding My Platoon Brothers, Vietnam Then and Now, the author describes his journey to find and reconnect with his platoon brothers; the men he served with during the War in Vietnam. This moving journey includes reconnecting with those brothers still living in the United States as well as those who fell during combat during the war. 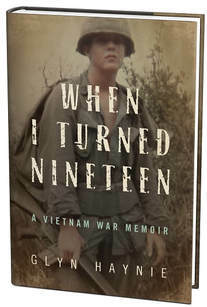 Whether describing a reunion planned to allow these veterans to reconnect and share their experiences, rekindle past friendships, and reforge their bonds of brotherhood, or making the journey back to Vietnam to visit past battlefields and former Fire Support Bases, this author’s narrative will deeply move his readers. This incredible story will touch the hearts of readers in so many ways. The author includes many photographs, maps, journal excerpts, and descriptions that breathe even more life into the already unforgettable story. It is a story that will touch every true American’s soul.